The U.S. reopened its embassy in the Middle Eastern country of Yemen yesterday but warns it’s still a major threat due to terrorists being harbored within its borders. Wait a second, where have we heard this before? Oh, yeah…and six years later, important archaeological sites are still getting pilfered in Iraq. The U.S. reopened its embassy in the Middle Eastern country of Yemen yesterday but warns it’s still a major threat due to terrorists being harbored within its borders. Wait a second, where have we heard this before? Oh, yeah…and six years later, important archaeological sites are still getting pilfered in Iraq. Yemen might be a potential hotbed of terrorism, but it turns out it’s also an extremely important country for architecture and urban development, including several protected World Heritage Sites. Let’s take a tour, shall we? 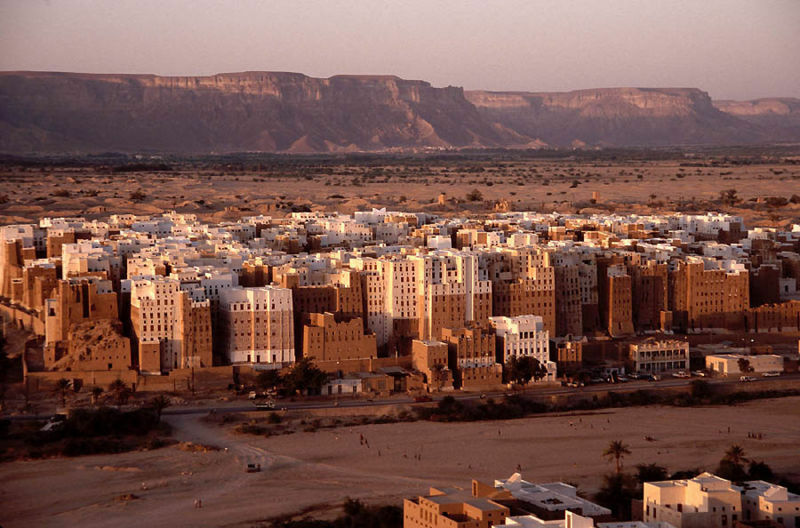 Our first stop is Shibam, a walled city nicknamed the “Manhattan of the desert” for its 16th-century skyscrapers, some of which are as tall as eight stories. The city was built on a mound to protect it from a flooding river nearby, which also led to the unique height of its buildings. This meticulously-designed city with its tall, mudbrick towers and narrow streets is one of the earliest and best preserved examples of vertical architecture and urban planning. Zabid, a historic town dating to 820 that’s positioned close to Africa, is the site of an ancient Islamic university, supposedly where the term ‘algebra’ was coined. 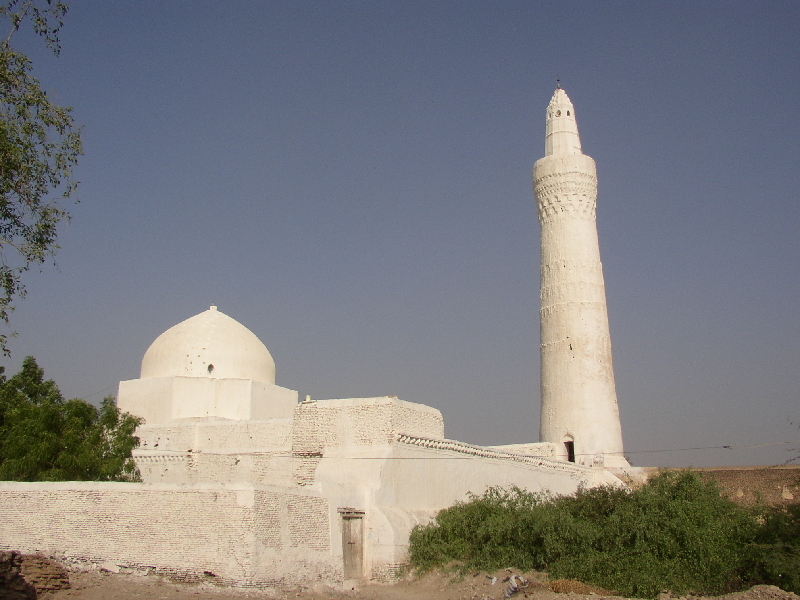 The Great Mosque of Zabid was constructed in the 9th century and, like other buildings in town, is notable for its whitewashed baked-brick walls and carved stucco facades and doorways with intricate, geometric patterns (fitting for a university town). Back in Sana’a, Yemen’s capital–where those embassies are located–you’ll find a thriving metropolis that’s been inhabited for over 2,500 years. The old town is also a protected World Heritage site with incongruously tall, rammed earth towers connected by maze-like streets. The structures are covered with elaborate decorative white trim, creating a landscape that’s more akin to piped-icing on gingerbread houses. GOOD found this amazing interactive panoramic shot of the city at sundown and there are also some incredible shots of local markets and residences. But even architectural protection doesn’t mean they’re safe. 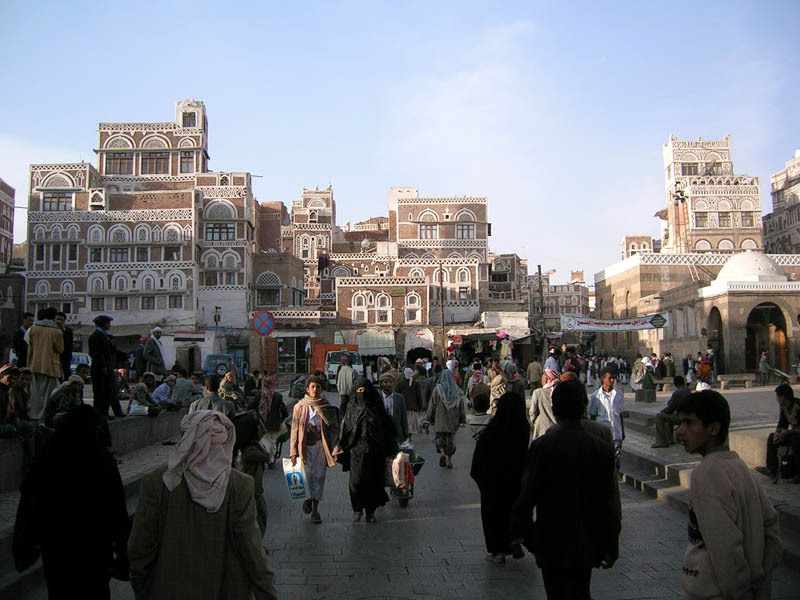 Two of these cities, Shibam and Sana’a, saw a series of terrorist attacks in March, where several Korean tourists were killed by Al-Qaeda militants. And all three sites are threatened due to poverty and unrest in the country. Let’s not toss a war in there, too, okay?